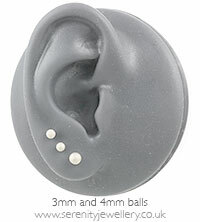 Sandblasted 316L surgical steel screw-on balls. 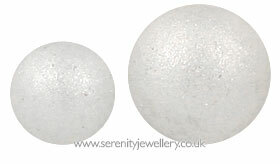 The sandblasting gives these balls a whiter colour than polishing. Perfect fit, nice colour and very good quality. It doesn't cause any irritation and it goes in water so I always have them on I'll definetly buy more! Nice matt silver colour with a rough surface - a bit fiddly to screw on, wish there were larger sizes. No peeling/damage problems yet.